BARG has been surveying hedgerows at Peasemore since 2003. The interim results from fieldwork in 2003 are presented here; further details on work in 2004 & 2005 will follow. In the summer of 2003 a start was made on the survey of tree & shrub species, as well as the recording of hedge height & structure. There is much of this surveying still to do, and the surveying of ground flora and hedgerow earthworks will also commence in the spring of 2004. 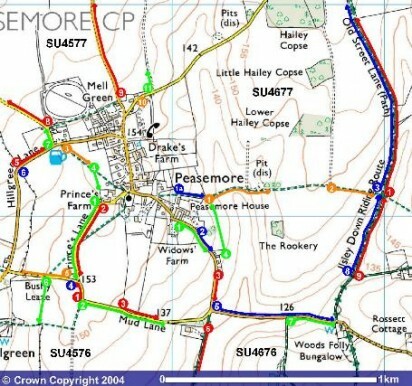 The Enclosure: The main focus in the summer was on surveying the hedgerows around the Peasemore ‘enclosure’, although the survey has also started to extend out to other areas of the parish. The results from the hedgerow survey around the enclosure are very interesting. Some of these hedges have proved to be consistently rich in species. On the eastern side of the enclosure hedges with 7 and 6.83 species per 30m were found (SU 4676-3 and 4676-1). The latter of these hedges also contained copious ‘indicator species’ of age (hazel, maple, spindle, dogwood). The overgrown nature of these two hedges may even mean the species count has been suppressed. On the south side of the enclosure the route of the road (Mud Lane) appears to take a noticeable ‘diversion’ around the enclosure – in other words the enclosure might be earlier in date than the road. It is therefore interesting that we have a section of hedge along the north side of this road (SU 4576-3) that in its latter half (particularly) is also reasonably rich (6.16 species per 30m). The hedge along the south side of Mud Lane (SU 4576-2) is of reasonable richness, with an average of 5.16 species per 30m and containing hazel, maple, spindle and dogwood. Again the species count for this hedge may have been suppressed by its overgrown nature. One of our teams also surveyed the hedgerows either side of Prince’s Lane – the road on the west side of the enclosure. The average species count for these hedges – 4.62 on the west side (SU 4577-1), 3.5 on the eastern (enclosure) side (SU 4577-2) – are noticeably lower than elsewhere, but the hedges still contained significant quantities of indicator species (especially hazel and maple). Another noticeable feature of these now overgrow hedges is evidence of former coppicing – it could well be that these hedges are ‘woodland relics’, explaining the lower species count, but that is an investigation for this spring. Suffice to say for now that at several places around the enclosure the hedges on both sides are of a richness that could be consistent with a medieval date. This would extend the date range of the lanes that make up the ‘enclosure’ beyond the current map evidence, which indicates the pattern is at least 250 years old. Old Street: We have also begun the task of surveying the hedgerows along both sides of Old Street. 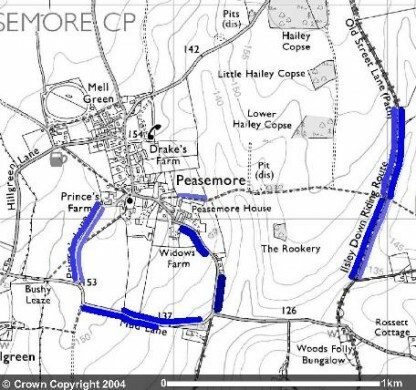 This is the byway along the eastern side of Peasemore parish, which, it has been suggested, could be as old as the Bronze Age. The eastern hedgerow of this lane (SU 4676-9) looks reasonably young (3.38 species per 30m) perhaps resulting from the enclosure of Beedon Common. The hedge on the western side of Old Street (where the parish boundary actually runs) was richer (5.0 species per 30m), but also very loosely structured, appearing more like a thin strip of woodland in places (SU 4676-8). The partial extension of the survey along Old Street in a northerly direction (hedges SU 4677-3 and 4777-1) showed a reverse of this pattern with the western hedge (on the Beedon Common side) being the richer. These two hedges appear to be different in nature from further south, which a greater presence of hazel. Interpretation of this area should, however, wait until the remainder of Old Street is surveyed. Many thanks to all those that gave up their time to take part in the 2003 hedgerow survey. Base images produced from the Ordnance Survey Get-a-map service. Image reproduced with kind permission of Ordnance Survey and Ordnance Survey of Northern Ireland.